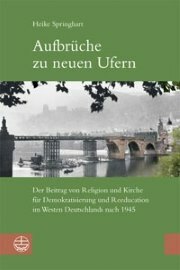 Review of Heike Springhart, Aufbrücke zu neuen Ufern: Der Beitrag von Religion und Kirche für Demokratisierung und Reeducation im Westen Deutschlands nach 1945(Leipzig: Evangelisches Verlagsanstalt, 2008), 360 pages. ISBN: 9783374026128. The immediate aftermath of World War II was one of the most eventful and decisive transition periods in twentieth century history. The Axis nations had been defeated, but there were millions of displaced persons and refugees, extensive destruction of cities and infrastructure, and a rapidly shifting postwar political landscape that eventually culminated in the formation of the Soviet bloc and NATO, the division of Germany into east and west, and the onset of the Cold War. There was a widespread sense among the victorious Allied authorities that the postwar agenda for Germany was just as crucial as the military defeat of the Nazi regime, and that the long term stability of Europe would depend on addressing the German situation differently than the victors of the First World War had done after 1918. Thus, the postwar policies of the British, U.S., and French occupation governments were focused not just on immediate political and military issues but on the longer-term challenge of ensuring political and civil stability, a task that included changing the political culture of Germany through re-education, denazification and various civil society programs. This approach particularly characterized the American zone. Whether in Roosevelt’s speeches, Hollywood newsreels, military propaganda, or publications by U.S. aid organizations, the rationale behind U.S. involvement in the war had often been articulated as a fight for American democratic ideals. Hence, a central goal of many U.S.-led postwar programs was to educate and train Germans in the practices of democracy. Heike Springhart’s Aufbrücke zu neuen Ufern is a detailed history and analysis of one such program, the partnership between the U.S. military government and German Protestant church leaders and organizations in Württemberg. Her focus is the work there of the U.S. Branch for Education and Religious Affairs (ERA) between 1946-1948, which she sets in a broader historical context by examining the individuals and organizations, both in the U.S. and in Germany, who during the war helped lay the theoretical and political foundation for the ERA’s work. There is also a concluding chapter that offers a conceptual framework for understanding the potential role of religion in post-conflict processes of democratization and social transformation, drawing on the German example as a case study. The ERA’s agenda cannot be understood separately from the wartime “White Papers” and programs that began to address these issues before 1945. Springhart particularly examines the influence of Paul Tillich, the religious socialist German theologian who left Germany in 1933, as well as the Council for a Democratic Germany, an organization of leading German emigres and U.S. intellectuals that was founded in 1944. During the war Tillich, who was teaching at Union Theological Seminary in New York, delivered a series of radio addresses for the Voice of America directed toward “the other Germany” (Thomas Mann regularly spoke on a similar series of radio broadcasts for the BBC). In talks that combined criticism of Nazism, praise of democracy, and an appeal to the deeper cultural and moral standards of the German people, Tillich hoped to reach not only Confessing Church members, but potential oppositional groups in the military and among intellectuals. The Council for a Democratic Germany was one of several U.S. organizations that sought to raise American awareness of “the other Germany” and draft potential approaches for democratization programs after the defeat of Nazism. Springhart also explores some of the literature that began to shape this thinking during that war, notably the work of Talcott Parsons, a Harvard sociologist who believed that societies could be changed through “controlled institutional change,” and Richard Brickner, a New York psychiatrist who in a 1943 book (Is Germany Incurable?) argued that the positive qualities of the German psyche had to be strengthened through social and political re-education programs. As early as 1942, U.S. military and political leaders began discussing such programs as crucial tools for the democratization of postwar Germany. It was clear that the implementation and effectiveness of such programs would depend on reliable German partners, and the primary partners identified early on were German church leaders, particularly those with ties to the Confessing Church. The ERA emerged in 1946 as a distinct division under the auspices of the Office of Military Government (OMGUS), with sub-offices focusing on Catholic, Protestant, and “Interfaith-Relations and Free Church” affairs. General Lucius Clay’s directive to ERA officials was that they offer support and guidance to German religious leaders of all faiths to strengthen the work of existing religious bodies such as church youth organizations and the social welfare programs of the Evangelical Hilfswerk. The ERA also played a key role in the development of various postwar Evangelical Church press agencies and radio broadcasting services. The Allied goal was not that the ERA actually establish and run these programs themselves, but rather help the Germans themselves to do so. Still, over the course of time the U.S. developed a number of programs in conjunction with the ERA’s agenda, including cultural and educational exchanges that brought German clergy and academics to the United States.